Now is a good time to do a sidedress application. Research shows that there is little or no benefit waiting to apply nitrogen much past the V8 development stage. In fact, depending on the year, it can reduce yields. Some of our studies have shown that with split applications, delaying sidedress to V12 reduced yields compared to sidedress at V8. Since the crop is growing and using nitrogen quickly now, apply a nitrogen source that is readily available for crop use. 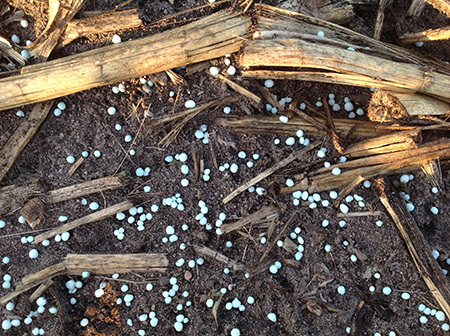 UAN solutions, urea, and anhydrous ammonia are all readily available for crop uptake after application. Avoid using slow or controlled release fertilizers at this point. There’s also no need for nitrification inhibitors. Since crops are using a lot of water, the potential for excess precipitation and the accompanying risk of nitrogen loss is shrinking rapidly. If you are applying urea on the surface, use a urease inhibitor to reduce volatilization losses. Because we typically get frequent precipitation at this time of the year, a urease inhibitor protects urea from nitrogen volatilization long enough to get sufficient rain (at least ¼ inch) to move urea into the soil. If you have not applied all your nitrogen, the Nitrogen Rate Calculator is an excellent tool to help determine your optimum N rate. Make sure you subtract from the calculated value the nitrogen you already applied. 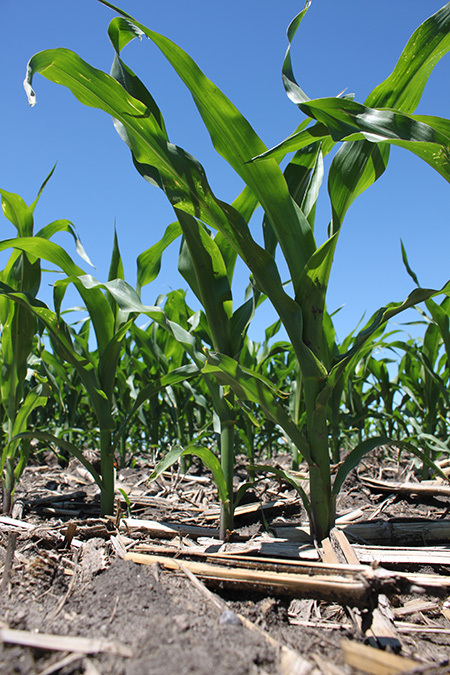 If you are trying to apply additional nitrogen because the earlier application suffered substantial loss, the supplemental N worksheet can give you some guidance. For sidedress applications many worry that nitrogen needs to be applied in some specific way to make sure it is close to the crop roots. The reality is that the corn crop has a massive growing root system, so regardless of placement, the roots will find nitrogen. Nitrogen also moves with the flow of soil water as it is being suctioned by crop roots. 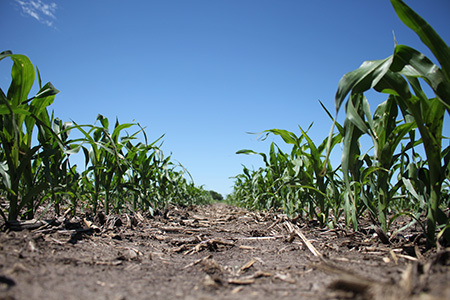 So as long as there is water, which is typically not a problem this time of year, the nitrogen you apply at sidedress will find its way into the crop. If you prefer an injection application, the middle of the inter-row space (15 inches from the row in 30 inch row spacing) works well. At this point in the growing season, corn roots are reaching the middle of the inter-row. Injecting nitrogen closer to the row can result in unnecessary root damage. 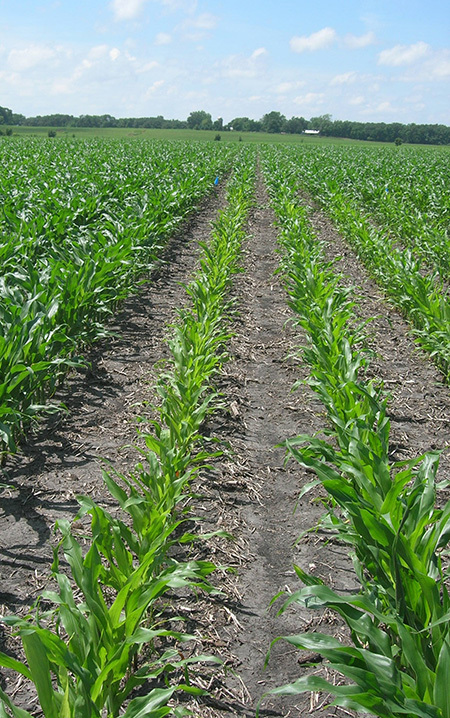 Finally, minimize fertilizer contact with the crop canopy as much as possible, as nitrogen can cause leaf burn. If you are using UAN solutions, use a drop hose to dribble on the soil surface rather than spraying on the canopy. With dry products like urea, application once the whorl has formed can create burn as the granules will be funneled in the whorl. Some research has shown that with urea while it will create a localized burn, the damage is aesthetic, as it may not translate into a yield reduction. That said, we suggest limiting as much fertilizer contact with the canopy as possible.